On 28th of March 2017 was accepted resolution by VGTU Council "Due to structural changes in academic units of Vilnius Gediminas Technical University No. 1-1 and decided: from 1th of July 2017 to combine the Departments of Environmental Protection and Water Management Engineering to an integrated unit at the Faculty of Environmental Engineering as the Department of Environmental Protection and Water Engineering. Head of this department assoc. prof. dr. Raimondas Grubliauskas (from 2018-09-03). The Department of Environmental Protection at Vilnius Gediminas Technical University in 1993 was founded under the initiative of Prof. dr. habil. Pranas Baltrėnas. The establishment of the Department of Environmental Protection was promoted by the abundance of environmental protection problems in the world and in Lithuania. These problems include air pollution, pollution of surface and groundwater by sewage, soil and ground contamination by petroleum products and other chemicals, the formation of hazardous waste, loss of landscape and biodiversity, irrational use of natural resources, physical pollution, and many others. The first postgraduate study program was developed in 1995, undergraduate students - 1996, graduate engineers - 1998, distance undergraduate learning students - 1999. Since 1998 started the development of doctors of science in the scientific field of environmental engineering and landscape management, since 2013 started the development of doctors in the science area of technology, science field of environmental engineering. 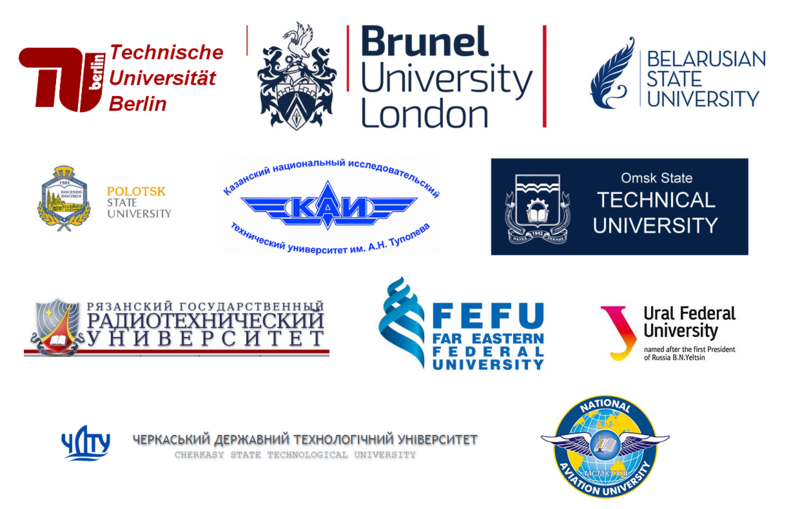 There is was lacking of original study literature written in Lithuanian and English in department, therefore 3 textbooks and 15 educational books and 20 monographs were published in the department. In order to reduce the shortage of resources, the Department of Environmental Protection performed maintenance works - in 1993. There are 3 outsourced works in the department of 50 thousand Lt, and in 2013 works completed for 1.2 million Lt. 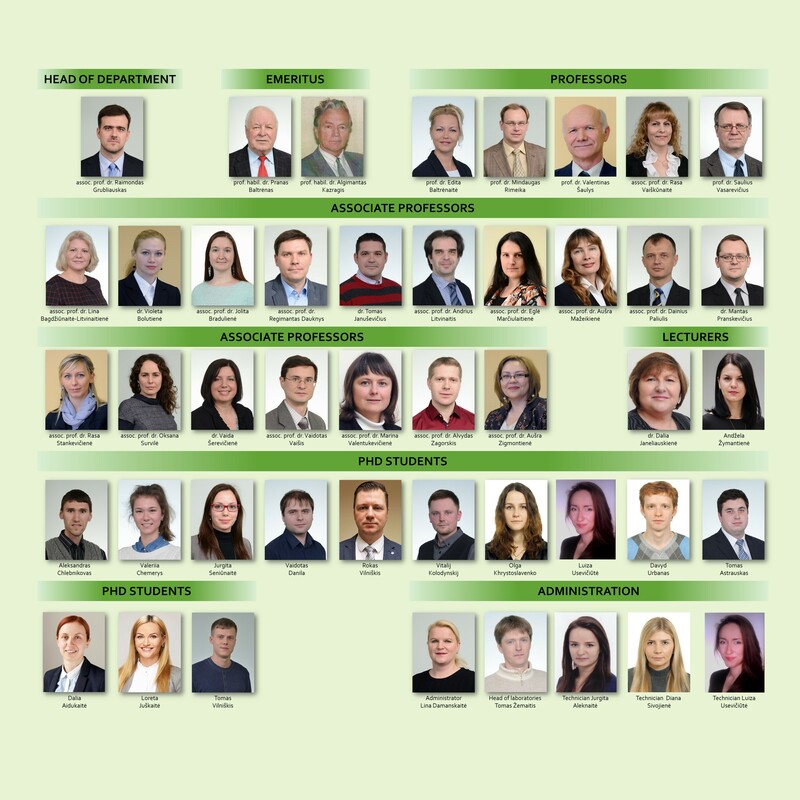 Since 1993 department has created over 30 Lithuanian patents. Every year, the number of full-time lecturers grew, including doctors of sciences, who have defended their doctoral dissertations in VGTU. Before assembly of the two departments in 2017 17 lecturers worked in the department, including 3 professors (2 of them had a professor's pedagogical name), 14 associate professors (including 9 with a docent's title), 3 lecturers and 4 technical staff. In Lithuania, water supply and sewerage lectures began at Kaunas University in 1924. At that time, it was one of subject provided for construction engineers. 15th of August 1940 Department of Urban Sanitation was founded at Vytautas Magnus University in Kaunas. Steponas Kairys was appointed as head of the department. He was one of the founders of the Lithuanian Social Democratic Party and Signatory of the Lithuanian Independence Act on16 of February 1918. S. Kairys worked not only at the university, but also was a good engineer as designed and developed Vilnius and Kaunas water supply and sewer systems. In 1939, he published the first water engineering textbook in the Lithuanian language "Urban Sewerage". After the Second World War, the Department of Water Management continued work in Kaunas Polytechnic Institute. Specialty of Water supply and sewer was established in 1948. The first graduation of this specialty issued in 1952. From 1952 until 1989 at Kaunas Polytechnic Institute graduated 1954 of water engineers. The Soviet authorities decided that water-engineering studies should be transferred from Kaunas to Vilnius. After moving the department to Vilnius, the preparation of water management students in Kaunas was stopped. Water engineers have developed the country's water management infrastructure, currently about 16,000 km of water supply networks and 15,000 km of domestic wastewater networks and 8,000 km of rainwater sewage networks are in operation. Nearly 85% of the country's population are connected to the centralized water supply and sewer networks. September of 1989, the Department of Water Engineering at the Vilnius Gediminas Technical University was established. Dr. A. Matuzevicius was appointed as the head of the department and last for almost twenty years. 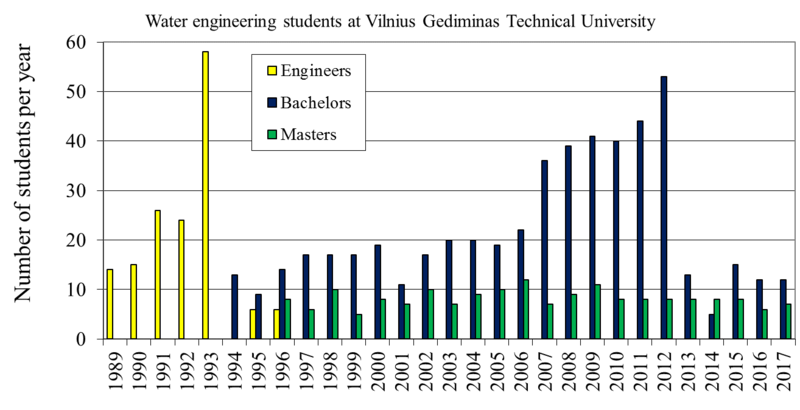 From 1989 until 2017 at Vilnius Gediminas Technical University graduated 854 of water engineers. Student preparation tendencies shown below in the graph. 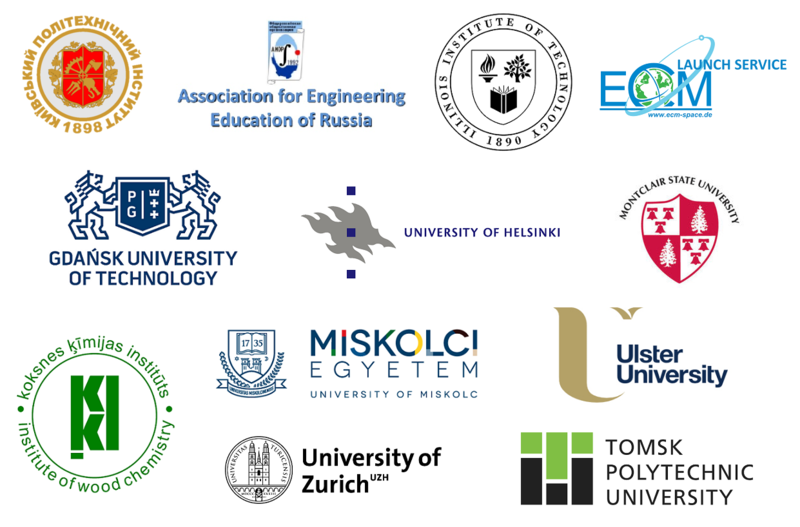 Vilnius Gediminas Technical University is the single institution in Lithuania where water engineers are preparing. By degree of VGTU Senate in 2017, Department of Environmental Protection and Department of Water Engineering joined together, and Department of Environmental Protection and Water Engineering was created. The Books prepared by staff of Water Engineering Department: “Small sewage treatment plants design” (M. Rimeika, A. Kirjanova, 2011), „Water Microbiology” (A. Mazeikiene, 2010), „Design of drinking water treatment plant facilities” (A. Sakalauskas, M. Valentukevicienė, 2008), “Water supply and treatment systems” (A. Sakalauskas, V. Sulga, 2007), “Design of sewage systems” (M. Rimeika, 2006), “Design of water supply and sewage systems for building” (Z. Paulauskienė 2005), “Outdoor water supply and water receivers” (A. Sakalauskas, V. Sulga, 2005), „Illustration atlas of water management facilities and technologies“ (A. Sakalauskas, 1999), „Waste water treatment with activated sludge“ (A. B. Matuzevicius, 1998), „Design of reagent and cation exchange water softening and ion exchange demineralization facilities” (A. Sakalauskas, 1996), „Water supply and waste water discharge systems for building“ (K. Blažys, V. Šulga, 1994). Drinking water treatment technologies – iron, manganese, ammonium, fluorides removal from ground water. Wastewater treatment technologies – biological wastewater treatment by activated sludge, biological removal of phosphorus and nitrogen. Sludge processing technologies in wastewater treatment plants: sludge thickening, dewatering, drying, composting and reuse. Hydraulic modeling of water and sewer networks, reduction of water loss, optimization of network operating conditions. 1. Egle Marciulaitiene won an award of the President of the Republic of Lithuania given the winner of the contest for the best thesis on environmental protection. 2. Egle Zuokaite won the ‘Best Thesis’ award from the contest organized by the Lithuanian Young Scientists' Union for the best thesis on environmental protection. The topic of the thesis Research on Composted Sewage Sludge and Methods for Reducing Gaseous Emissions. 1. The President of the Republic of Lithuania awarded Dr. Inga Jakstonienė for the best thesis on environmental protection. 2. Dr. Raimondas Buckus from the Department of Environmental Protection won an award from the contest for research works done by the young scientists of the Lithuanian Academy of Sciences for the written PhD thesis in the field of environmental protection. Lecturer Assoc. Prof. Dr. A. Zigmontiene from the Department of Environmental Protection was awarded a special prize by the Minister of Transport and Communications of the Republic of Lithuania in the student contest ‘Smart City’ for suggested original solutions in the field of transport and a prize by the Cembrit company for the most impressive and interesting facade. 1. Lecturer Assoc. Prof. Dr. A. Zigmontiene from the Department of Environmental Protection was awarded an acknowledgement for the 3rd place in the national student contest ‘Smart City 2’ by the Prime Minister of the Republic of Lithuania for the concept of a smart building reconstructing the cinema in Kaisiadorys town and transforming it into a multifunctional, adaptable to environmental conditions and energy saving structure. 2. Mindaugas Rimeika was awarded by the Swiss State Secretariat for Economic Affairs for crated software estimating a reduction in water loss WU-Compass: www.waterlossreduction.com. 3. Prof. Dr. Saulius Vasarevicius was awarded an acknowledgement by Universiti Teknologi Malaysia UTM for organizing the seminar Sustainability Assessment for City and Industry. and Water Engineering was awarded an acknowledgement by BWaste International BV (the Netherlands) for advice on the implementation of the technological development of smart municipal waste containers in the municipalities of Lithuania.